Boychik Lit: Any Piggies Going to the Fair? Any Piggies Going to the Fair? This weekend (April 26 and 27) is that enormous annual tent show, the Los Angeles Times Festival of Books, which takes place on the UCLA campus in Brentwood. 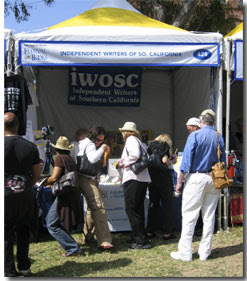 I will be working the IWOSC (Independent Writers of Southern California) booth 428D -Dickson Plaza Midi (near Royce Hall) from 10 am to 2 pm on both days. Drop by and let's talk about Rubber Babes (the forthcoming sequel to My Inflatable Friend), boychik lit, and a group of 500-plus writers committed to preventing the further dumbing down of America. Book Review: "Mistress of the Revolution"